There’s a new member of the 2014 BMW 5 Series lineup with a diesel-fueled 535d sedan. The 550i powertrain has also seen a nice boost, making 443 hp instead of 400 like last year. Two new equipment lines—Luxury and Modern—have been added, while minor exterior styling updates and more interior storage can be seen as well. Every BMW 5 Series will also come standard with a navigation system. With a classic style, beautiful craftsmanship, and athletic build, it’s easy to see why the 5 Series is considered BMW’s “Ultimate Driving Machine” according to the brand’s advertising tagline. Sculpted hood lines lead to a sleek body, presenting an aerodynamic silhouette that makes sure the 5 Series is as fuel-efficient as possible. The characteristic BMW grille lets everyone know just what type of car you’re driving, while the integrated spoiler adds a bit of sporty flair to the car. 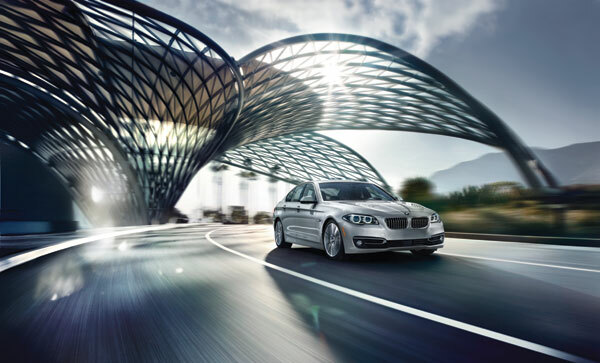 For the 2014 model year, the BMW 5 Series offers four different powertrains to choose from. For the 2014 528i, a turbocharged 2.0-liter four-cylinder engine produces 241 hp and 258 lb-ft of torque with a standard eight-speed automatic transmission and an automatic stop-start function that shuts down the engine to save fuel when the car stops. This engine gives the 528i the ability to reach 60 mph in 6.4 seconds. The BMW 535i comes with a turbocharged 3.0-liter inline six-cylinder engine that churns out 302 hp and 295 lb-ft of torque. Those who choose the rear-drive models come with the choice of the eight-speed automatic or a six-speed manual, while the xDrive models are automatic-only. The 535i also comes with standard stop-start technology, while also boasting the ability to reach 60 mph in 5.9 seconds. A 3.0-liter diesel inline-6 engine powers the brand new 2014 BMW 535d, which produces 255 hp and 413 lb-ft of torque. This new powertrain comes with a standard sport version of the eight-speed automatic transmission with paddle shifters and automatic stop-start. Finally, the BMW 550i is powered by a 4.4-liter V8 engine, the most powerful engine of the bunch, churning out 443 hp and 479 lb-ft of torque. The same sport version of the eight-speed automatic transmission comes with the 550i, along with a standard auto stop-start. Depending on the powertrain you choose, the fuel economy can differ. With the highest fuel economy of the BMW 5 Series, the 2014 535d diesel boasts an EPA-estimated 30 mpg combined, while the 528i boasts the second best with 27 mpg combined with rear-wheel drive and 26 combined with xDrive all-wheel-drive. The BMW 535i receives 24 mpg combined with the automatic and 23 combined with the manual, while the all-wheel-drive model gets 23 combined. Finally, the 550i has the lowest EPA-estimated fuel efficiency with 20 mpg combined for the rear-wheel-drive and 19 combined with all-wheel-drive. Elegance and comfort come together to create a beautifully designed cabin for the 2014 5 Series cabin. A twin-dial, analog gauge cluster reflects the typical BMW instrument panel with a much more modern, clean look. The rest of the dash is sleek, with the standard iDrive interface minimizing the need for buttons with a wide screen in the center of the dashboard. A touchpad to the top of the controller even allows you to hand-write inputs using your fingers, adding a nice touch of technology to the interior. Add the comfortable seats with plenty of room both in the front and rear and you can’t deny it’s a terrific car. When it comes to safety, the BMW 5 Series is a top-notch contender, earning the top five-star rating for overall crashworthiness in government testing and the highest possible rating of “Good” in Insurance Institute for Highway Safety testing. Standard safety features include antilock disc brakes, stability and traction control, front-seat side airbags, side curtain airbags and active front head restraints. The BMW Assist emergency communications system is also standard with automatic crash notification, an emergency response button, remote door unlock, and stolen vehicle recovery. A Driver Assistance Plus package adds multiple safety technologies, such as blind-spot warning system and lane-departure warning system.